Greg Palast on the ground in the battleground state of Ohio: where he finds three ways the vote is, indeed, “rigged” ”“ but FOR the GOP. [Election Day, 2016 in Columbus, Ohio] For two decades, computer touch-screen voting machines have been derided as “push and pray” voting. You had to take it on faith that the machine records your vote as you intend. The machines lacked a “paper record” to audit and recount. So, voting rights attorney Robert Fitrakis was thrilled to learn that many of Ohio’s voting machines would, for this election, have a brand-new anti-hacking capability. The computers could now take a photo of every voter card loaded in, time stamp each marking, and keep the images in an order that allows an audit and recount. Mike Pence is the poster boy for voter ID laws. No one has benefited more from this legalized form of vote theft than the Republican nominee for VP. In his acceptance speech at the Republican National Convention in Cleveland last Wednesday, Pence said he “wants every American to succeed and prosper” ”” however he certainly doesn’t want every American to vote. Indeed it was thanks to Indiana’s voter ID laws ”” the first of their kind in the nation ”” that he squeaked into the governor’s office. These seemingly benign laws, requiring voters to show approved photo ID, have a sinister and very deliberate effect: they suppress black, brown, young, old, poor ”” and, above all, blue votes. 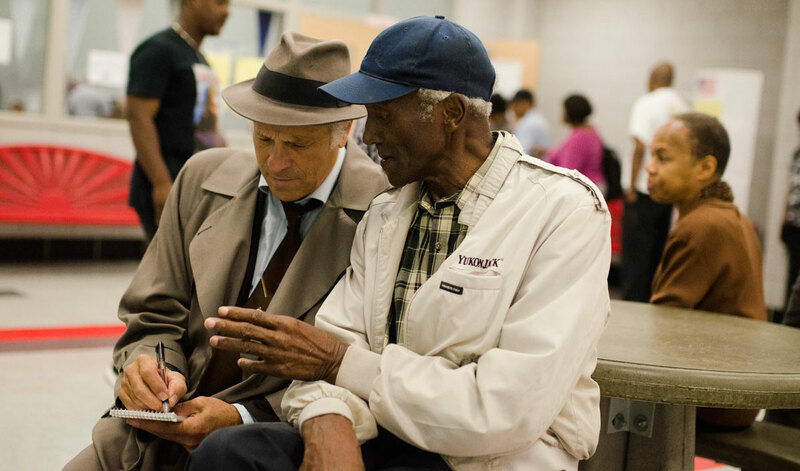 In this week’s Best Democracy Money Can Buy, Election Crimes Bulletin, Flashpoints’ Dennis J. Bernstein gets the lowdown on the sleazy practice of vote-rigging-by-ID-law from political hanky-panky expert Greg Palast. They also discuss how these racist-by-design laws tap dance around voting rights and discrimination protections, and could ultimately help Pence and Trump waltz into the White House. Image from Palast’s upcoming film The Best Democracy Money Can BuyWatch the trailerFirst, live from New York”¦. Lee Camp, host of RT’s Redacted Tonight and resident Palast Investigative Fund humorist was arrested Tuesday afternoon at the Democracy Spring protests in Washington DC. He was one of hundreds who have been arrested in the actions, which are now on day three of ten days of protests. Democracy Sping is a coalition of like-minded groups working together for voting rights, getting money out of politics and protecting the environment. Listen to Lee’s interview with RT’s Eunan O’Neill on his arrest. “There’s a lot of people that are standing up and willing to get arrested to call attention to how money has corrupted our entire system,” Camp told RT in the interview. Camp has since been released from police custody. It was one of our team’s weirder investigative discoveries: The recently departed Justice Antonin Scalia”” alev ha shalom ”” in 2011, was ticketed for recklessly driving his black BMW. The big boys are confident that Sen. Marco Rubio has locked up the Republican nomination. But who’s locked up Rubio? I called my bookie in London. The betting professionals were not surprised at Marco Rubio’s big Iowa showing. The smart money has been on Rubio since October 31–despite the fact that Rubio was polling at just 9%. Paul Krishnamurty, politics odds analyst at Betfair.com, told me that, among professional betters, over just two days, Rubio soared from zero to odds-on favorite to win the GOP nomination. Why would the guys who bet the rent money place it all on Rubio””and what suddenly changed on October 31? Because, despite the fact that 9 of 10 Republicans rejected him, on Halloween, Rubio won the only vote that counts: The Vulture’s. It was page one news in the New York Times: Paul Singer, Influential Billionaire, Throws Support to Marco Rubio for President. I’ve been hunting Singer, AKA The Vulture, for nine years across four continents. And now the carrion-chewing billionaire has decided who will be your next President. The Vulture, not the Kochs, has become the Number One funder of the Republican Party. The Vulture’s blessing signals to the other billionaires where to place their bets. Singer doesn’t “donate” to candidates. He invests in them. And he expects a big, dripping return on his money. But why Rubio? Because Singer’s little hatchling is doing The Vulture’s bidding already. Singer has launched a murderous financial “vulture” attack on Argentina. Singer is shaking down the gaucho nation for $3 billion. Half a century ago Alabama state troopers and a mob of racist thugs beat African-Americans and others as they marched across the Edmund Pettus Bridge, demanding no more than the right to vote. By the time King led 25,000 demonstrators singing “We Shall Overcome” into Montgomery, the state capital, on March 25, the president of the United States had introduced the Voting Rights Act. Free at last””to vote. Roll credits. Obviously I was not speaking with King Jr.””a bullet stole him from us in 1968. The question was posed by his son, Martin Luther King III. I spent an afternoon at his home in Atlanta, where we pored over the latest evidence that Americans of color were blocked at the doors to the polls in the 2014 midterm elections””by the hundreds of thousands. 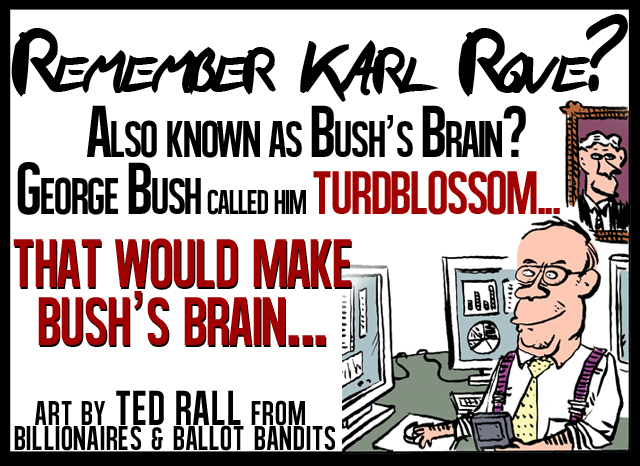 Note from TheMudflats.net: In 2011 Karl Rove wrote a column called “Why Obama Is Likely to Lose in 2012” – Rove was betting on North Carolina to be a swing state for the Republicans… Romney took the state but to Rove’s surprise he failed at stealing Ohio for the third time. Just Google “Karl Rove Meltdown,” and you’ll see a video from Fox News election night, he did not take it well. Supreme Court to decide on Voting Rights Act this month. Jim Crow is alive and well ”” and he has mounted a new attack on the law Martin Luther King dreamed of: the Voting Rights Act. This month, as early as Wednesday, the Supreme Court will decide on the suit brought by Shelby County, Alabama, which challenges the right of the Department of Justice to review changes in voting procedure. But Jim Crow is still alive and well in these states. Examples: Attempts to cut the number of early voting days, to expunge “illegal alien” voters without any evidence, refusing Spanish-language ballots, have been blocked by the Department of Justice and courts because they have stopped Black and Hispanic citizens casting ballots. Voting rights attorney Robert F. Kennedy Jr. has called for prison time for the new US Attorney for Arkansas, Timothy Griffin and investigation of Griffin’s former boss, Karl Rove, chief political advisor to President Bush. God lost this time. I counted: Bush mentioned God only six times in his speech to the NAACP today. The winner was ‘faith’ — which got seven mentions, though if you count “The Creator” as God, well, then the Lord tied it. Well, not “all.” The nine-to-one Black-to-White ballot spoilage rate is a national statistic””not just an Ohio trick. Last year, I flew to New Mexico to investigate the 33,981 cast but not counted ballots of that state in the 2004 race. George Bush “won” New Mexico by 5,988 votes. Or did he? I calculated that, of the all the ballots rejected and “spoiled,” 89% were cast by voters of color. Who won New Mexico? Kerry won””or he would have, if they had counted the ballots. But they didn’t count them. And that was deliberate. It’s in the plan. It’s the program. And the program for 2008 is simple. Two million ballots were cast but not counted in the 2000 race. (Over half, 54%, were cast by African-American.) In 2004, the GOP kicked it up to THREE million. Get ready, these guys aim high: “four in ’06” and “five in ’08” looks to be their game plan. Step 1: “Spoiling” ballots””1,389,231 of them. In the vote-count game, these are called “undervotes” and “overvotes.” You can recognize these lost ballots by their hanging chads, punch cards without punches (an Ohio specialty), paper ballots eaten by scanners, and touch screens that didn’t know you touched them. Step 2: Rejecting “provisional ballots”– 1,090,729 in this pile. Voters finding themselves at the “wrong” precinct, or wrongly “scrubbed” from voter rolls get these back-of-the-bus ballots first inaugurated in 2002. In ’04, provisional ballots were passed out like candy to voters in the poorest precincts. They handed them out””then threw them away””one million dumped in all. In Ohio, Republican Secretary of State Kenneth Blackwell changed state rules, allowing him to toss out the ballots of legal voters who cast ballots in the wrong precinct although these citizens were told their vote would count after confirming their registration. How many lost their chance to vote by scrubbing, purging and blocking? That’s anyone’s guess, but one million would not be an unfair estimate””and that’s not included in the 3.6 million tally of ballots uncounted. Was it deliberate? Oh my God, yes. I’d like you to take a look at the “caging” lists the Republican National Committee concocted to challenge voters with “suspect” addresses. It included page after page of African-American soldiers, shipped overseas. Mission accomplished, Mr. President? Also, coming to a polling station near you: more caging lists, scrub lists, ID challenge lists and more. Exactly why do you think they are compiling those “War on Terror” and War on Immigration databases? Behind the 2000 felon purge lists and behind the 2004 caging lists were databases from the same companies that now have those homeland security contracts. Are they saving us from Osama””or from Democrats? I wish I could give you a book on a page, because information is our weapon: Turn on the lights and the cockroaches scatter. That’s why I’m asking you to read RFK’s article on the Theft of Ohio””and GET ANGRY. Then read, “Armed Madhouse: & The Scheme to Steal ’08“””AND GET READY.